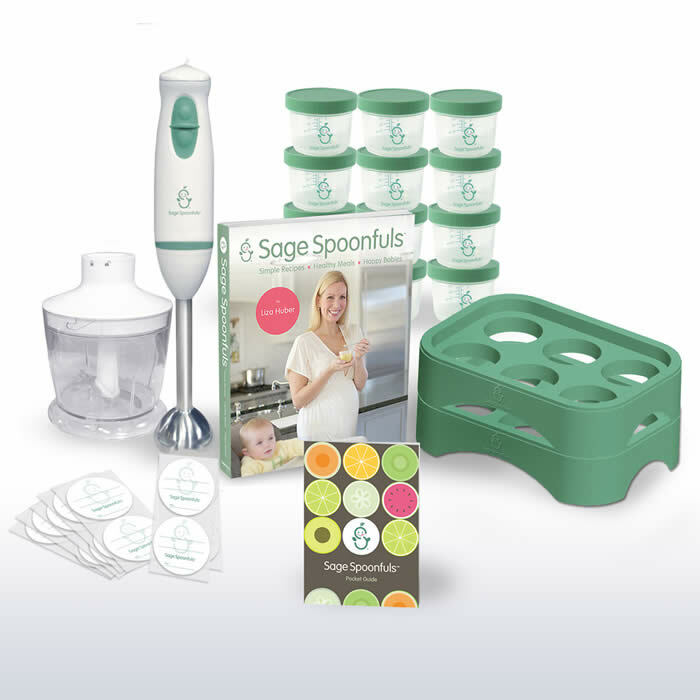 Do you want to make your own baby food, then Sage Spoonfuls is the right product for you. So now you wonder what is this girl talking about making your own baby food at home. So we all know that all natural food is tons better for your family but did you know that you can make your babies food at home? So that is just what Liza Huber, the proud owner, did for her babies. She came up with Sage Spoonfuls as an at home healthy food maker for your baby. It only takes 1 hour every 2 weeks to keep your freezer stocked. to make your babies food. So you may wonder to yourself; what can I make, how will I know what to make? Well, Liza Huber includes the Sage Spoonfuls Simple Recipe Book in the Starting package. This 19 piece system includes everything you need to make and store your own fresh, natural homemade baby food with ease! The Sage Spoonfuls immersion blender and food processor allow you to puree up to 2 week’s worth of baby food in just seconds and storing is a breeze with the Sage Spoonfuls (Made in the USA!) Storage System. – Immersion Blender and Food Processor – purees a month’s worth of baby food in just seconds! So when I first got it, I looked at everything and you could tell that the Blender and Food Processor where made from great quality and not going to break on you. The jars fit perfect with the holders. Then when you wanted to place in the fridge or freezer they stacked very well together; you didn’t have to fight to put together any of the pieces. I wanted to make some strawberries so I first cleaned them and got the stem off of each of them and then threw about a cupful into the food processor and in less than one minute I had perfect pureed strawberries. The entire process took only a few minutes from start to finish. Normally I just smash them down which takes about 5 minutes and I have to do that every time I need some. So I then made some more to put in the storage jars, I made enough for 4 jars and labeled the jars to see how well the sticker would stay. So I let 5 days go by and I went to get one out of the freezer get one to use and I noticed the label never moved and stayed on great which is what I need for I don’t mix up what is what when I make food. Overall the whole Let’s Get Started Package was amazing Liza Huber really gives you everything you need in the package. If you are thinking about raising your kids without baby food from the store this would be perfect for you. click here to see more details or look at other items she offers which are just as amazing. Also they are on Facebook and Twitter.